An experienced educator and inclusivity practitioner, Jasmine Love has devoted her career to fostering communities in which all children can pursue educational excellence. Jasmine majored in Psychobiology at Oberlin College and received her Masters in Education from the University of Pennsylvania in Psychological Services with an emphasis in cross-cultural counseling. 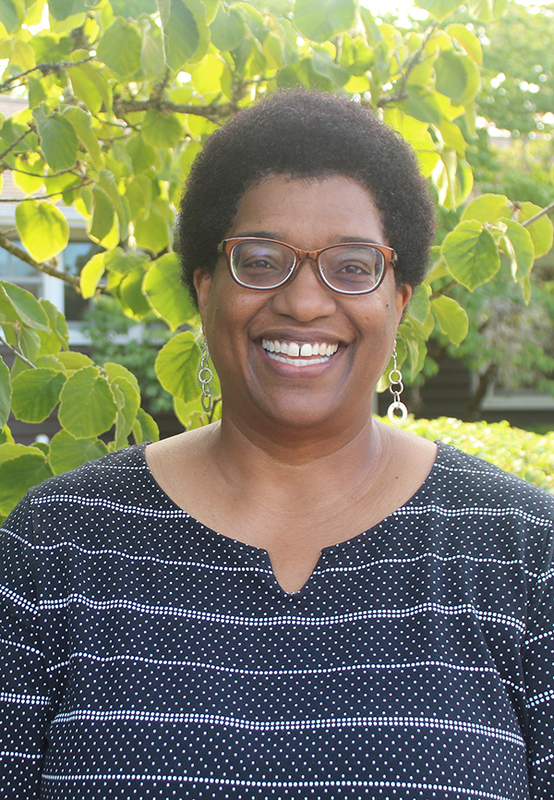 She has been in senior administration in similar positions at Westridge School and Chadwick School over the last decade where she has created identity-based age-appropriate multicultural education programs in the Los Angeles area. She joined the Catlin Gabel community in the summer of 2015. At what stage should children be introduced to multicultural programming? The students need a very seamless transition from division to division, and that’s why I think it’s very important to begin to have these conversations in preschool and continue through 12th grade. We begin with a developmentally appropriate focus on differences and identity and then begin to explore privilege and systemic inequities as we rise into the older grades. I would love to teach classes at some point on culture and identity for all of our students. How does self-identity change as children develop? When you’re in preschool and kindergarten students are trying to figure out, “Who am I as I relate to my family” and “who am I as an individual?” They’re not going to be grappling with huge racial issues – but they might notice, this child looks different from me or that adult looks different from my parent or guardian and they’re going to just say it, and it’s wonderful, it’s refreshing and we should be able to answer those questions. As they grow they begin to notice differences and hear about people being treated differently and we also begin to explain the history in this country. As we move through all the stages of development the message should be that difference is good, not fragmenting but something we all share, we all have something unique and different about us. We all have different family structures, we come from different neighborhoods, and it’s all good. In Lower School they start noticing more, “Who am I in relation to my friends?” And In the Middle School, that’s when students become these social justice kids, and start questioning society, asking things like “What do you mean, they can’t get clean water in Niger?” And they want to do something to make a difference. Then By Upper School they are ready to change the world and finding their own unique identities – and this is the place they become our teachers because the youth always lead us in these discussions. They’re more fearless. Do affinity groups play a role in developing self-identity? I think it’s important to have affinity groups in Upper School and Middle School and affinity activities in the lower grades. I think it’s a powerful thing for people to feel that they belong and we’ll have more conversations about how to do this with students that will not feel fragmenting but inclusive. I believe every single child is a child of diversity, meaning nobody is ever just looking through one lens. We all have privileges and we all have something that takes power away in this society. We have to move away from simplistic notions of diversity and understand the nuances. It’s a skill but one our students are going to need in the future. What are some of your favorite techniques for promoting cultural awareness? My main tool is having conversations across the lines that normally divide a community. One of the things that I think is going to be important at Catlin Gabel is to have a shared language around words like equity, culture, race, affinity, inclusion, identity, etc. I enjoy bringing people together for conversations but I am a teacher at heart, so I love student-directed activities (films, discussions, using theater and improve, creating culture and identity modules, collages, any kind of art). So it is less about techniques and more about safety for these inclusive teachable moments. Since diversity and inclusion are core values at Catlin Gabel it’s not optional that we teach cultural competency as a skill set, in fact Catlin Gabel students will be more successful in the world when they recognize that learning to interact positively with people different from yourself is a skill they are going to need more than their parents ever did. It is important for parents to be exposed to the same conversations their children are exposed to so they can continue the discussion at home. So at this point I am focused on being a cultural anthropologist and learning the Catlin Gabel culture but I’ve also been very happy to have many conversations with students and employees and parents who are already doing such great work. We all want our students to have an equitable educational experience and learn in an atmosphere of multicultural respect. What is your definition of equity? I think of it as an equitable education, so that means every single child has an equal chance to take advantage of everything that is here at Catlin Gabel. We live in a country where some people get to buy an education and some people don’t. I believe it is the responsibility of people in our community to also make sure we are looking at our impact on the greater Portland community. Are students at Catlin Gabel isolated from real world problems? The students here do not seem to be isolated from real world problems though they may choose to look at them theoretically, but depending on where they live they are exposed to different realities. When they share those realities that is where real learning happens and why having a diverse student body is the best way to get an education that prepares you for the real world. Does self-identity help young people better understand the larger world around them? Yes, once we understand who we are it is easier to understand someone else and recognize that we have some connections. We tend to break people into categories and define them as “other” but once we really start learning who people are we find out that we have many more similarities. The differences are just as important. But it is very hard to learn who someone else is if you don’t know who you are yourself. You’ve probably heard the phrase – the catchphrase for all diversity directors – lean into discomfort because that’s where the magic happens. If you’re not uncomfortable, you’re probably not learning something. So my job is to make people a little bit uncomfortable so that eventually we can get to the place to have some deeper conversations. The more you lean into those places you feel uncomfortable the larger your comfort zone grows.